When Apple announced that the Apple Watch would be able to use Apple Pay, the company's new mobile payment initiative, many wondered how secure the payments would be if the device lacked the security of Touch ID, which is used in the iPhone 6's implementation. Now, several members of the press have confirmed how the system works. Both Rene Ritchie of iMore and Cult of Mac report that when a user first puts on the Watch they must type in a PIN code to authorize Apple Pay. Once it's on, the Watch uses constant skin contact, which it can sense using the four sapphire-covered lenses on the underside of the device, to authorize payments. However, once the device is removed from a user's wrist, they must re-enter their PIN when putting the device back on their wrist. 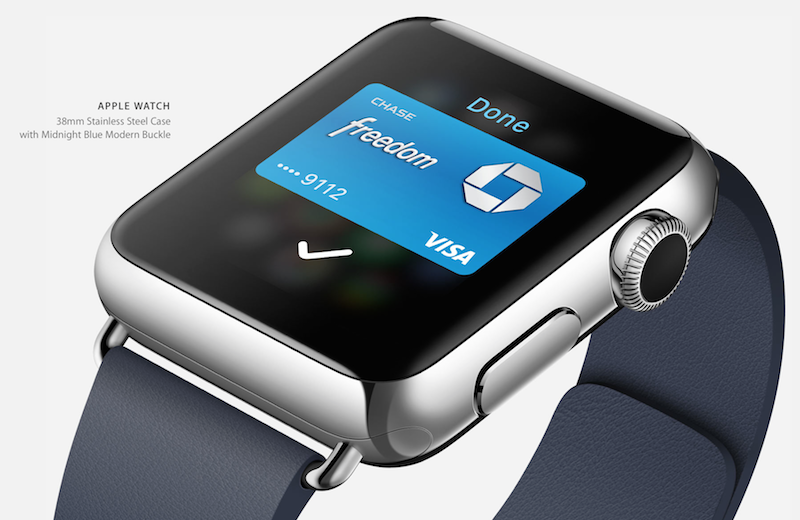 MasterCard's mobile payment executive Ed McLaughlin also told Re/code that the Watch would use the four sensors on the back of the device as a security measure, while Visa CEO Charlie Scharf said that Apple understood the risks of contactless payments and has a solution. The Apple Watch is due to arrive in early 2015 and will start at $350. Yes, I can just picture a thief walking into a store with a severed hand and paying for something with no one saying 'gee, that looks weird"
Not very secure. Crafty thieves would just have a slither of plastic at body temp to slide underneath the watch as they nab it. Im sure someone will start selling a tool. Bad idea to leave something authorised for a long time period. Asking for trouble. That's very cool. Hope for their sake that they patented that idea. Hopefully it detects that the hand is warm to prevent thefts. So the key to contactless payments is constant contact. I have bony wrists. With most watches I wear the back is rarely plastered up against the back of my wrist. How tight are people going to have to wear this thing? I think there's going to be a lot of re-entering your pin. So you enter your PIN and can make payments. Then every night you get home and take it off to charge and the next day you have to re enter the PIN. Sounds like just one more POS to remember every morning while I'm getting ready for work. No thanks. If your world is on the cusp of crumbling because you have to enter a 4-digit code once per day, you might have bigger problems bro.